Brad Keselowski led all 130 laps of Stage 2 to capture his second stage win at Martinsville Speedway in Sunday’s STP 500. Keselowski, who has one Martinsville win in his career, collected his second stage win of the season in winning his second stage of the day. He led 254 of the first 260 laps. Ryan Blaney made a move around Chase Elliott late in the stage to finish second in the stage. Elliott dropped in the final laps to fourth as Denny Hamlin made a move around him for third. The stage was punctuated by one early caution when the yellow flag came out on Lap 145 for debris on the track — an axle from the No. 15 of Ross Chastain. The STP 500 is scheduled to end on Lap 500. 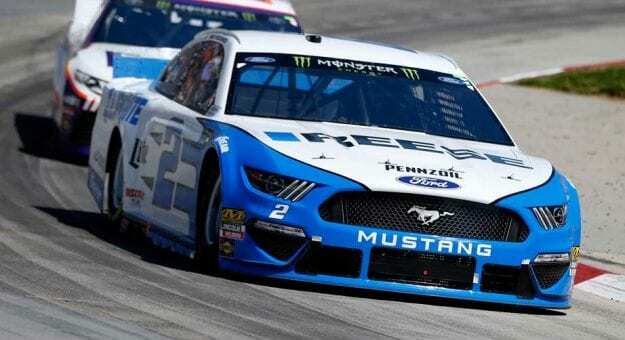 Brad Keselowski took the lead from pole-sitter and Team Penske teammate Joey Logano six laps into the STP 500 and held on at Martinsville Speedway for his first stage win of the season. Keselowski led 124 of the first 130 laps of Stage 1 on Sunday. Chase Elliott was second in the stage in his No. 9 Hendrick Motorsports Chevrolet, finishing just 0.113 seconds behind Keselowski as he closed the gap quickly in the waning laps of the stage. Defending race winner Clint Bowyer was sixth in the stage, while pole-sitter Logano finished seventh. The caution came out on Lap 64 when the right front tire of No. 34 Michael McDowell went down and he slammed into the wall coming out of Turn 4.